American Township Fire Department officials deal with the aftermath of a car crash on Elida Road Thursday night. 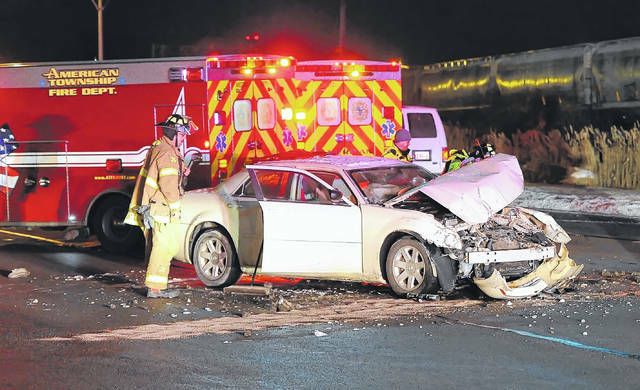 LIMA — Two people were hurt in a two-vehicle crash at Elida Road and Rosedale Avenue Thursday night. According to American Township Fire and EMS, a female driver and her infant child were taken to Mercy Health St. Rita’s Medical Center for treatment of non life-threatening injuries. The other driver did not seek treatment. The intersection was closed for about 45 minutes while American Township Police worked the scene. No other details were available late Thursday night.